Even before the 2 Games Workshop stores near me closed up, I went to my FLGS, (Game Vault) on a regular basis for the stuff I need. The other night was no exception. Since I recently picked up a commission and I need to match some paint, I decided to swing by and see what was in stock. Fortunately for me, I found the perfect color to match what I need and it's going to save me hours of work. And this isn't the only time, when I've needed a certain model or whatever... they've been great about getting ahold of it quick and for a good price. So I hope you're as lucky as I am and have a FLGS near you that helps you out. If you've got a store near you that you want to "promote" because they help you out, leave a comment with their name, link and location and I'll add it to the post here for everyone to see. The guys are all really nice there and everyone that plays there is incredibly friendly! 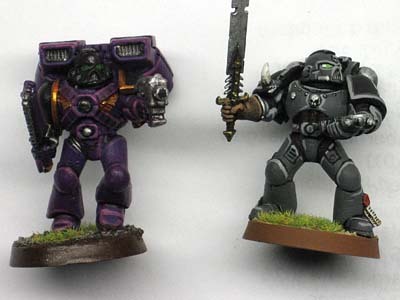 On a different note Ron, nice looking Relictor Marine! Thanks, I've always wanted to put together a Relictors force. Of all the background out there, I really enjoy their stuff. Indiana is lucky to have a great chain of stores, The Game Preserve. http://www.gamepreserve.com. Having lived in Lafayette, I can say that their store there is great. And since moving to the south side of Indianapolis, the store on that side of town matches the respect I have for the Lafayette store. The also have locations on the north side of Indianapolis and in Bloomington. Labyrinth Comics and Games, in Ann Arbor MI right off U of Michigan main campus runs nice events and hooks you up when you need to order stuff. Their in store stock level could be better though. I have been going to the Chantilly Game Parlor since '93 and have gotten to know the staff and owners very well over that time. Great place, lots of room for gaming, and good, knowledgeable staff that are all gamers in one way or another themselves. Absolutely fantastic support from the owner of any game people want to play. Great amount of stock, with just enough room for product and a lot of gaming tables. Clean and orderly too! Fun contests with great prize support. If you're stationed at Fort Hood, you can't go wrong checking this shop out. A great atmosphere with a lot of great people. Bell of Lost Souls is based out of this shop. A LOT of room to play, with a good selection of product. Again, another nice clean and orderly place to hang out. The owner is really friendly and helpful, with lots of support for customer driven endeavors like the summer campaigns BoLS put together. This is THE Austin gaming store. heh. I've played at both the North and South Indianapolis Game Preserves. While I primarily frequent the North Store, (how can I resist a FLGS located in a place called 'The Fashion Mall'?) it's a small store, but with a helpful staff. 40K night is on Wed. there. The South Store is larger, and has more turnout, but their primary night is Sunday afternoon. I do go down there periodically to get games on Tuesdays and to play some new faces. Cap City games has a great community, and a great selection. The owner is a long time gamer (40K Tau, Fantasy O&G, plus all sortsa RPGs) and very supporting of the local community with regular tournaments and events. Cool, thanks guys. It's interesting to see where everyone plays and just how wide spread everyone is. Would recommend a trip to Fred-burge for Game Vault games? @jack - we've gotten a lot of good reviews from people in Richmond who have come up since the GW store in Richmond closed. From the link Ron posted (www.thegamevault.net) you can hit our forums and get a general idea what the 40K population is like - they are a pretty active bunch. We're also sponsoring the Iron Fist League's (NoVA gaming league) Games Day tournament in May. The guys in Gamesworkshop Chester are really helpful and friendly... and I was at Warhmmer World last weekend in Nottingham and they can order Forgeworld kits to your door without charging delivery! so that was a touch of luck! Also, Drax suggested I ask you to put my shotgun tutorial on here! Charles Feduke: Thanks for posting and letting us know. King's Standard Bearer : Listen to Drax and send me the link! jpalomba: Have you got a link?